Tiny house trailer inspection day has finally arrived! We’re taking the next step in building a tiny house. A lot of research and calling around has gone into this day and we’ve certainly learned a lot. But let’s start from the beginning. In order to register our tiny house trailer, we have to get a blue slip first since it’s a brand new trailer. Don’t mix this up with a pink slip because it only applies to existing trailers. You also need a VIN (Vehicle Identification Number) for the trailer. Luckily our friend who built the trailer sorted that bit out for us. Thank god, because there’s, even more, the paperwork involved in getting a VIN in NSW. So in order to get a blue slip we have to get our tiny house trailer inspected first. We went to a few different service stations in the area but received very mixed feedback. They all seemed to be lost with inspecting a trailer as big as ours. Eventually, we were told that we had to go to a truck service station since our tiny house trailer is very long and also has electric brakes. Finally, one competent piece of advice! Luckily we found a truck service station just around the corner from us. The next thing we had to sort out was renting a vehicle appropriate for towing our tiny house trailer. So we were looking for a dual cab ute / 4WD. But in order to test the electric brakes of our trailer, the car also needed to be equipped with an electric brake system. It was harder than we thought to find a vehicle like this but eventually, we got lucky on the Gold Coast. What a relief. Getting to this point alone took weeks of research and gathering information. So when inspection frenzy day finally arrived we were really excited. This would be a busy day that truly deserves to be called “frenzy”. We got up really early because we had a tight schedule ahead of us. Picking up the car, having the trailer weighed, having the trailer inspected and finally returning the car. But of course, we forgot about daylight savings in Queensland and ended up being too early. Hahaha, classic mistake! 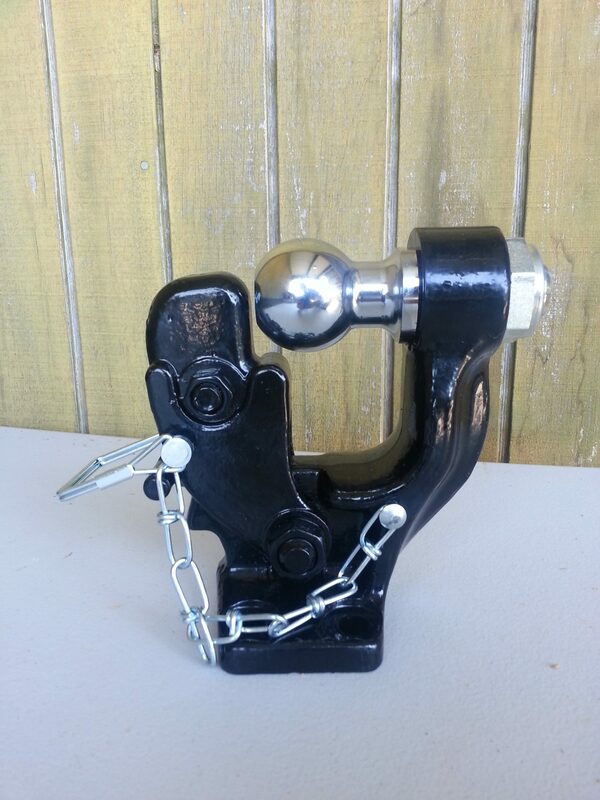 Eventually, we picked up the car and back at our place we connected our tiny house trailer to the pintle hook tow bar. Everything looked great but then we realised that they gave us the wrong adapter for the electric brakes at the car rental place. So we jumped back in the car and went to Byron to find a matching adapter. Luckily the first petrol station we tried had the correct one. So we raced back to our place, connected the trailer AND the brakes and everything was working fine. With a delay of an hour or so we made our way through narrow windy country roads to the weighing station with a big as trailer in tow. 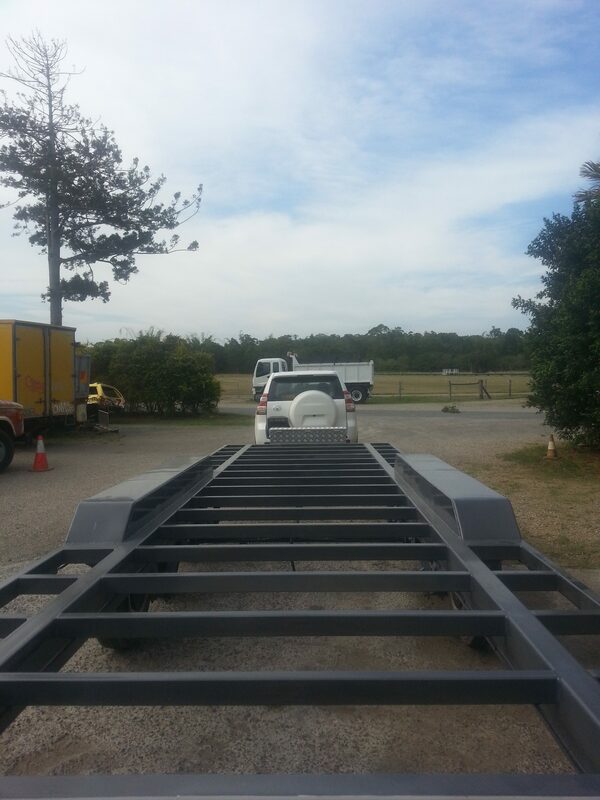 Weighing the trailer is a necessary step in the process of having it inspected. Our friend who built the trailer had it weighed in Queensland already but NSW doesn’t accept that. So we had to do it again. Very annoying. We know now that our trailer weighs a solid 1.48t. She’s a heavy beast! With the weighing done our final destination was the truck service station. At this point, we were already almost two hours behind schedule and hoping that the inspection guy would wait for us. But everything worked out. A good hour later we finally held the blue slip in our hands. Success!!! Little did we know at this point that the guy’s made a mistake in filling out the blue slip-form. When we went to the Roads and Maritime Service office to register the trailer the next day the lady behind the counter told us that important information was missing on the form and that she couldn’t process it. Haha, it’s so tragic that it’s almost funny. I was holding the number plate in my hands already and then she took it away from us. So we had to meet up with the inspection guy again a few days later. This time he filled out everything correctly and we were finally able to register our trailer. Woohoo, let’s never do this again! So what can we learn from this? 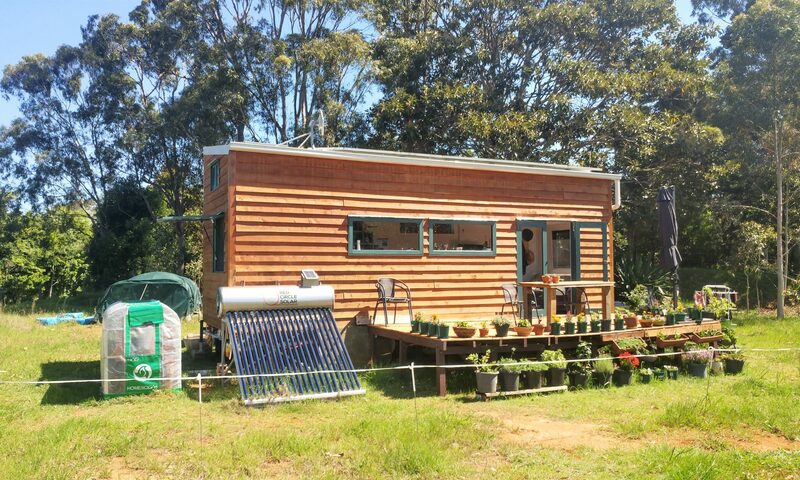 It was a bit of a mission for us to register our tiny house trailer because it is a “home-build”. Also, the trailer was made in Queensland and regulations differ from state to state. If you want to avoid dealing with different regulations and inspection frenzy I suggest ordering a trailer from a trailer company or even a tiny house company in your state. The trailer will still need to be inspected but usually, the trailer companies should be able to assist you with it. If you do the inspection our way, keep lengths and weight of the tiny house trailer in mind when hiring a vehicle to tow it. Also, make sure you have the correct tow bar to tow your tiny house trailer. There are regulations in NSW around this as well! Have all your paperwork ready for inspection. This includes a receipt for the trailer, specs of the trailer and other relevant documents. If you have to apply for a VIN you will also have to provide receipts for materials used for building the trailer. Requirements will also be different depending on the kind of slip you’re applying for. The blue slip is for brand new trailers that were never registered before. Pink slips are for trailers that were registered before. As always, check regulations for your state because they most certainly vary. Previous PostPrevious Make the most delicious and healthy bread in just one hour! !